This entry was posted in ammunition, pistol, self-defense, weapon and tagged 45ACP, M1911. Bookmark the permalink. 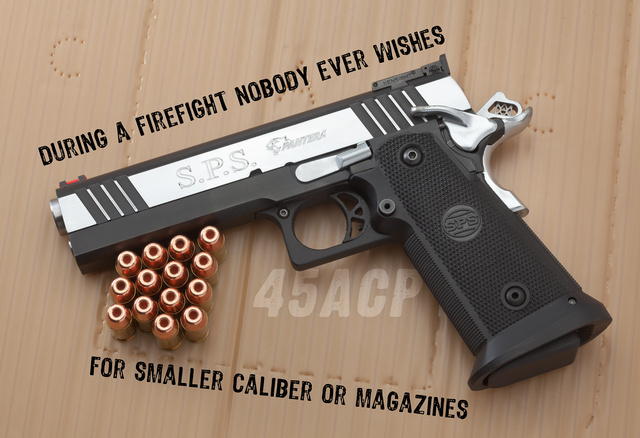 13 Responses to Smaller caliber and less magazine capacity? Not likely! I picked it because the plastic frame is thinner than metal frame+grips. It works fine with smaller hands. Over 3 pounds loaded… Looks like a great range gun. For carry I’ll stick with a sub 2 pound single stack 9mm 1911 that isn’t actually a bother to have on me all day every day. I’m with you. I carry a Smith and Wesson Pro Series 1911 with a 3 inch barrel. Grand Power P45 (a .45 ACP version of the K100 aka STI GP6) is probably better. Now, if only it also came in .357 or 10mm Auto..
A double stack 1911 and flared magwell isn’t really idea for CC… beautiful looking piece though. Works fine for a house gun. If I got caught in a firefight with only a .45, I’d wish I had a .223. Pistols seem underpowered for house-guns. About the only sure way of completely dropping someone quickly in is hitting them in the vitals with rifle rounds or completely riddling them with pistol bullets, or one-two loads of buckshot. Show-offs can do the same with head or heart-shots, but like in real life, to reliably land such shots you either need exceptional skill or take time to aim at a stationary enemy – which is a luxury and one you can’t hope to have when the time comes. Anything less and you risk getting shot by someone who is wounded, which at close range is a possibility. I’m thinking a Saiga shotgun would make a neat house-gun. Pity submachineguns are all banned, a .22LR smg like the American 180 is deadly, unlikely to over-penetrate , etc etc and can be fired from the hip easily. Looks suspiciously like the frame used for the old Kimber Polymer Custom guns… sounds like identical capacity, too. Not so new, just more posh (do like, though). Been EDC a Para P12-45 I’ve had for 13 years. Alloy frame, grip no wider than 1911, just a little blockier. Disappears on me IWB, and I have pretty big hands anyway. Just coincidentally, it carries 12+1, and the P14 mags lock in for followups.